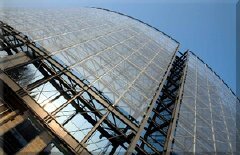 Milan-based Mediaset, Italy’s foremost private media company, recently completed an important facelift to its headquarters, the dominating element of which is the impressive, ventilated curved façade with laminated safety glass using DuPont™ SentryGlas® interlayer. The outcome is a work of art with striking visual impact as well as enduring protection for the building. Buildings of the 1970s, such as the Mediaset headquarters, increasingly are being renovated to respond to today’s building requirements such as energy efficiency and thermal insulation. SentryGlas® is being used to enable functional and appealing design innovation while allowing planners to maintain historical architectural elements. According to designer Paolo Maricttoni, the structural resistance of SentryGlas® made possible weight reduction in the laminated glass panels and assured continuing protection from glass breakage or fallout. SentryGlas® ensures the integrity of the glass façade.